on the 19 July 2011. After a difficult week, full of emotional pain, tears and grief I decided to return to my blog with a sweet note. 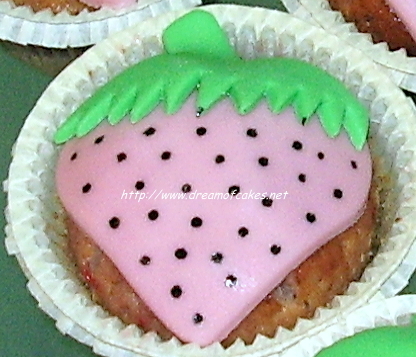 I tried a new recipe with organic strawberries, from my garden, and a lighter version of cupcake recipe. I decided that I should replace butter with vegetable oil and simplify the making procedure. Instead of using an electric mixer to whisk oil with sugar, I used a hand whisk. 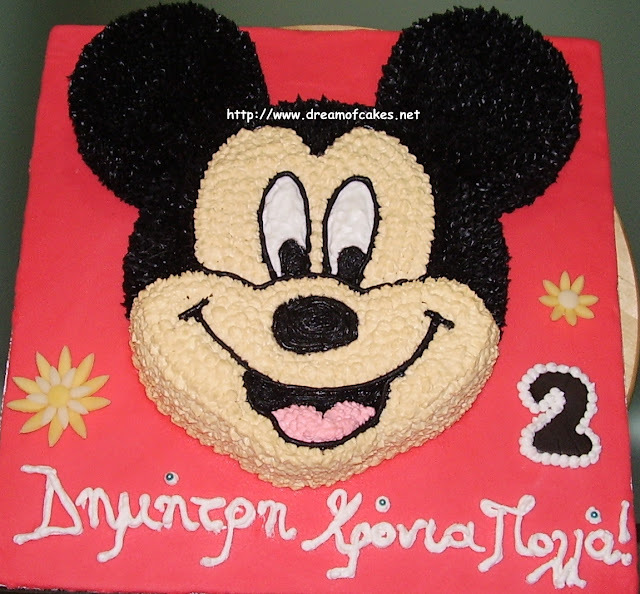 In this post I will share with you the decoration processing but please allow me to keep the recipe “secret” for the moment. I am thinking of writing an e-book with all my sweet creations so, as you can understand, I am not able to make public my new recipes. 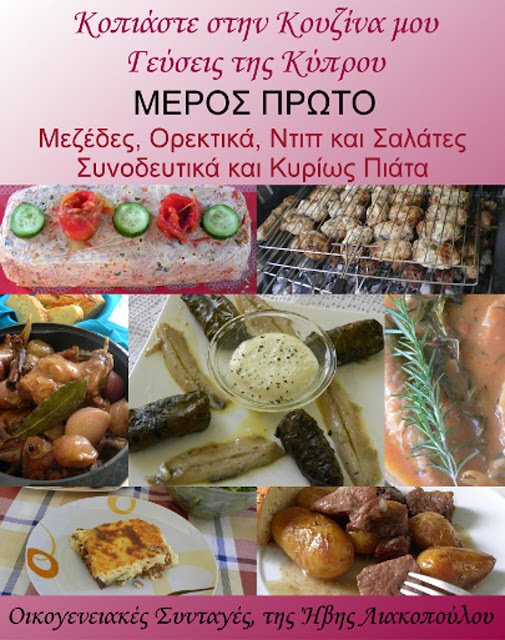 I promise that I will continue giving you some of my new recipes :-). 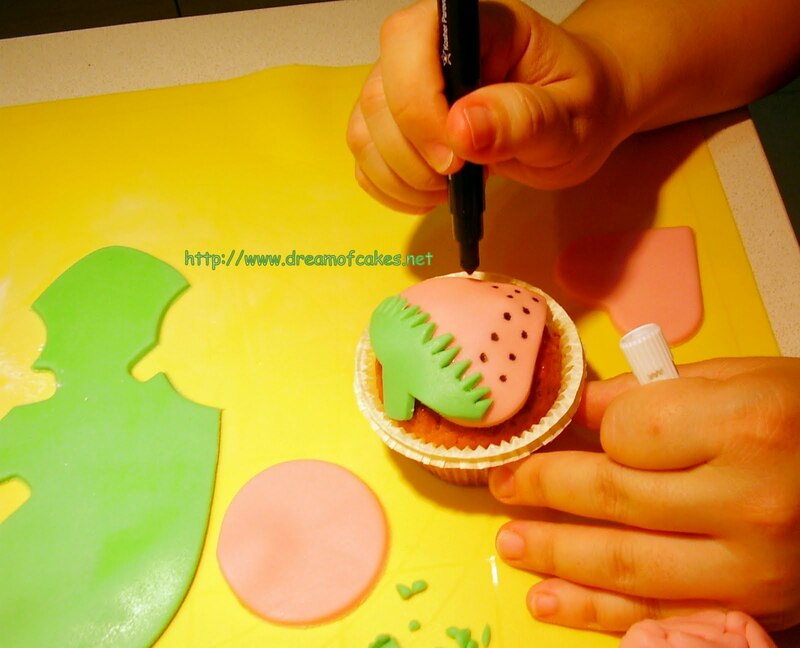 Allow the cupcakes to cool completely before you continue with the decoration procedure. 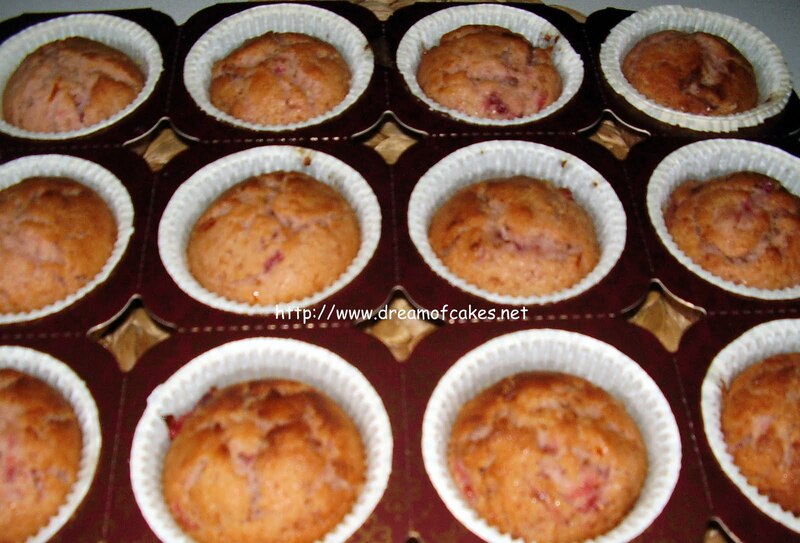 With the help of a regular food brush cover the cupcakes with a thin layer of organic strawberry jam and set aside. Gather all the decoration equipment before you start the decoration procedure. 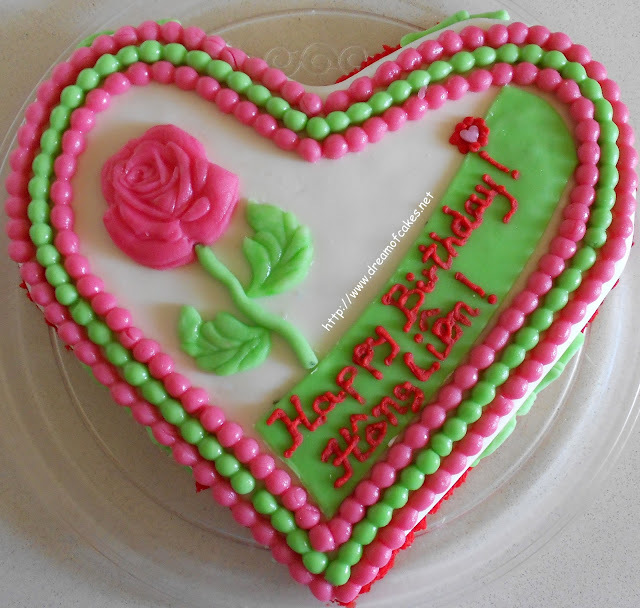 Color the regal icing and set aside. 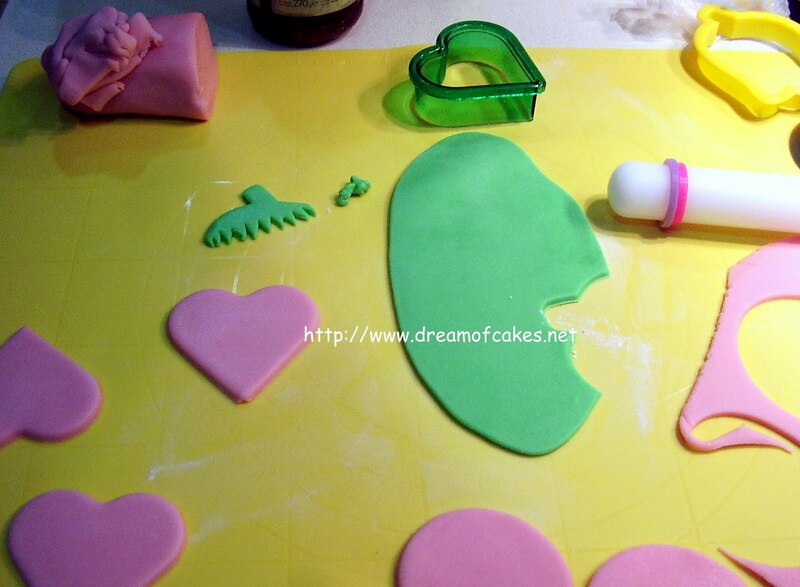 Roll the pink and the green fondant into 1/2 cm thick and with the help of the cutters cut your fondant into the shapes you see in the photo below. With the help of a knife form the strawberry stem. 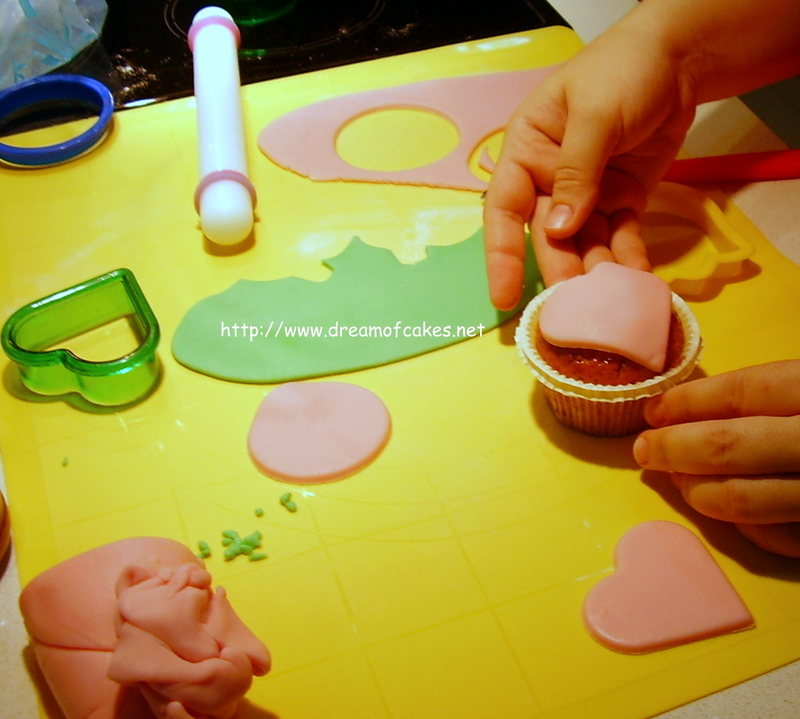 Place the heart shape on the cupcake. 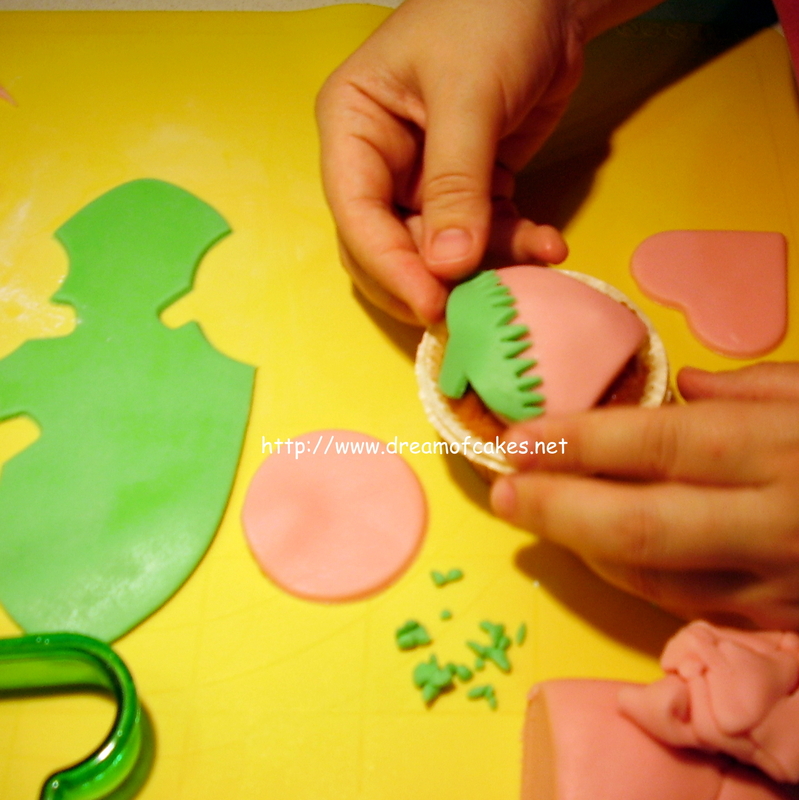 Then place the stem on the upper part of the heart in order to form the strawberry. You can use a bit of the strawberry jam to stick the stem on the heart. Mark black dots on the pink part of your strawberry. 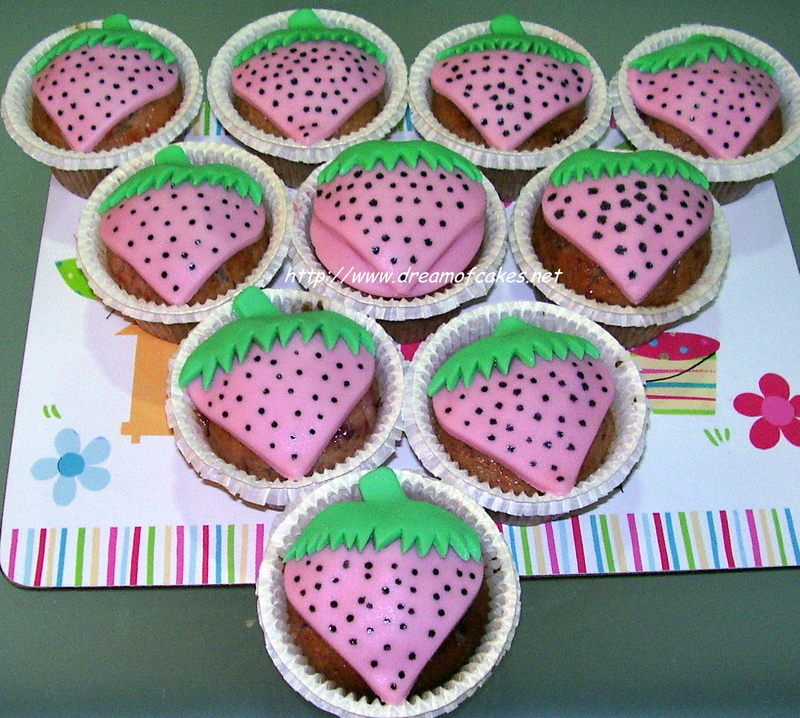 Your Strawberry Cupcakes are ready to be served! Wow! Looks gorgeous, my daughters are screaming for this cake now. I am sorry again to hear about the tragedy in Cyprus! BUT, I am glad these amazing looking cupcakes cheered you up a bit! These look adorable. Thank you for sharing in spite of such a difficult week. Your cupcakes are the cutest things - never seen something like that. You are very gifted. Very nice design and strawberries from your garden too, the fresher the better! Good luck with your book. Loved your cupcakes! Will be back for more! I hope you are healing and welcome back...we've missed you! I look forward to hearing more about your e-cookbook! They look really nice! Good job!! I was just looking at this post and my two and a half year old daughter said, "Look mama, just like strawberry cortcake!" (Cortcake = shortcake) I'll be filing this recipe away for a possible b-day party treat! These cupcakes will cheer up anyone! They are beautiful. Very cute & look good too! Wow these look like alot of work! Glad to see you back doing what you enjoy. These little cupcakes are fantastic, kudos to all your effort on the decorating. Very well done-Yum! Such adorable decorations on these. 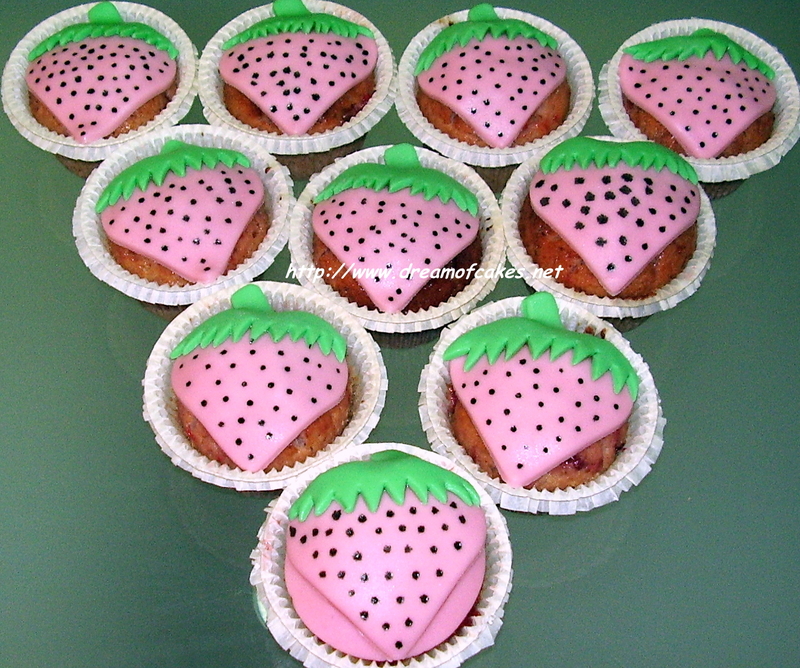 Love the strawberry toppers. Beautiful! They are absolutely gorgeous. I am glad you are feeling better...there is nothing like cupcakes to put a smile on your face. These are so beautiful! Sorry your having a bad time of things. As always, your cakes are stunning. They look so sweet with that lovely decoration. I do hope your week gets better. Chin up. These are so incredibly adorable! Hope this week is better for you :)! Sorry to hear about your difficult week. 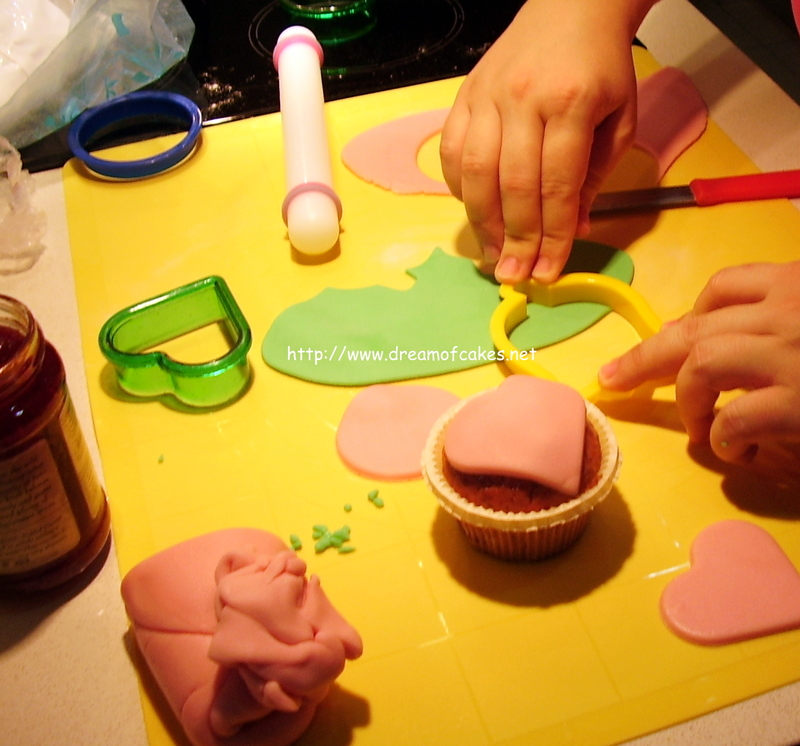 Glad you are back to baking, those cupcakes are too cute :) Write that e-book! Also wanted to tell you I am so happy you made the blondies, and even happier that everyone liked them!! 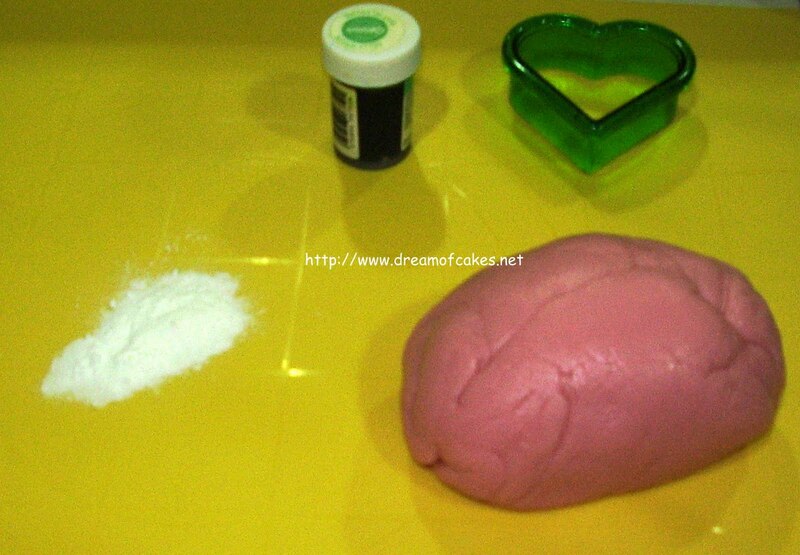 I have always wanted to try working with icing like that. They look great! ps. Good luck with the e-book - its a fantastic idea :) Oh and also, these cupcakes look divine! What a lovely and clear tutorial, they turned out perfectly :) Im sorry to hear about your tough week, i always find baking a brilliant distraction and i hope it worked for you too! And congrats on today's Top 1 on FoodBuzz!!! Please feel better... I also feel better when I just bake something yummy in the kitchen, so I dont think about any problem that is might up at the moment. What a neat idea! My girls will love these!! Thank you so much for your lovely comments and your support!! Being in the Foodbuzz TOP 9 was a pleasant suprise for me!!! Thank you once more...! Congratulations in being in Top 9! These are awesome and very creative! Those are CUUUUTe cupcakes! Just absolutely adorable! I LOVE these! They are so stinkin' cute!!! And congrats on Top 9! these cupcakes are fantastic and deserved to be on the top 9! Awww, they're so cute! Hope that they helped make your week a small bit brighter. These are just beautiful! What a perfect treat for summer. I would love these at a BBQ! Wow, what a fantastic post and congrats on making it in the Top 9. 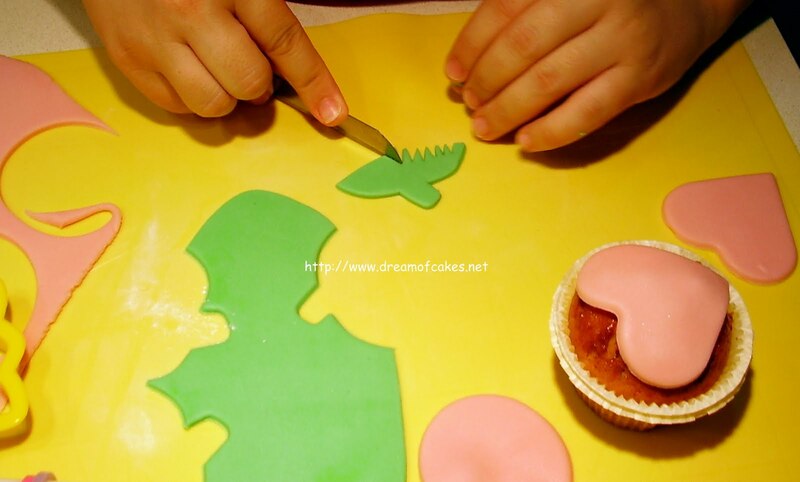 Your cupcakes look beautiful and so cute, wish I had your talent. I hope your book is successful, good luck! Eftychia, I just love this idea and they're so pretty. You are one of my regular commenters on my wee little blog and I had to thank you. I love your blog and your creativity and kindness. It was something I had to share! these cupcakes make me smile! These are absolutely adorable. Love the colors and the cute shapes! (: Thanks for stopping by my blog - I'm definitely following yours now for more cute posts! These look so delicious! I can't wait to try and make them, though I doubt mine will look so cute! Hmm yummmmmmmy, i wanna to eat all of them. This looks absolutely delicious! However, A recent Stanford University study doesn’t really answer that question, but it found no evidence that organic foods are more nutritious. However, it also found that consuming organic foods reduces — but does not completely prevent exposure to pesticide residues. The findings unleashed a flood of responses from various groups, and it’s certainly not the end of controversy regarding organic foods. This is information I wanted to share regarding "organic" foods. This looks absolutely delicious. However, A recent Stanford University study doesn’t really answer that question, but it found no evidence that organic foods are more nutritious. However, it also found that consuming organic foods reduces — but does not completely prevent exposure to pesticide residues. The findings unleashed a flood of responses from various groups, and it’s certainly not the end of controversy regarding organic foods. This looks absolutely delicious. However, A recent Stanford University study doesn’t really answer that question, but it found no evidence that organic foods are more nutritious. However, it also found that consuming organic foods reduces but does not completely prevent — exposure to pesticide residues. The findings unleashed a flood of responses from various groups, and it’s certainly not the end of controversy regarding organic foods. I was pleasantly surprised to see the posting of this recipe. Not only is the decoration beautiful, but it looks incredibly yummy. Other than the design of these cupcakes, the fact that it's organic really caught my attention. Lately there has been a big controversy about whether or not organic foods are more nutritious and safer than conventional food. Still, there has yet to be a study to answer this question. Once found only in health food stores, organic food is now a regular feature at most supermarkets. And that's created a bit of a dilemma in the produce aisle.